“Mr Minister we will shoot you down; if you fit enough do as you say and bring the police in and get our weapons; otherwise these weapons will kill you; mark my words I will drink your blood; I am waiting for the right timing. 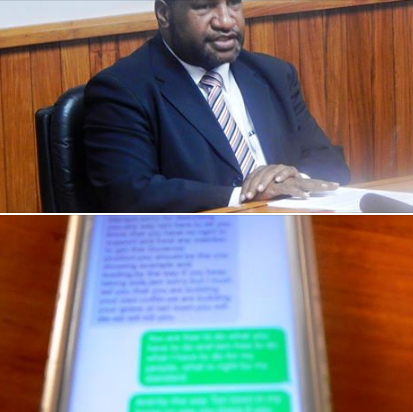 This was one of the type of death threats the Minister for Finance and Member for Tari-Pori James Marape revealed he had been receiving including assassination threats which have been made on his life and his family over the last two weeks. “It has gone to the stage where I can no longer keep it secret, and this has to be revealed to the public on the type of people we are living with, people who are leaders behaving like wild animals,” said Marape. Despite receiving similar threats in the past these recent threats have a more sinister, darker tone and this has become a serious concern for the Finance Minister and his family with police already conducting investigations into the matter. “Today in this day and age we can really check where this threats are coming from weather its a serious threat or a hoax and from preliminary findings, while working with police we have identified where these threats are coming from and the source of the threats,” stated Marape. Mr Marape revealed that two teams heavily armed in the city (Port Moresby) have been sponsored with the order to shoot to kill him; however, as an elected Parliamentarian leader of Hela Province and the country as a whole, Marape stated that he will not be intimidated and has suggested looking seriously at a moratorium on the sales of firearms in the country together with the return of all illegal firearms with an amnesty period and increased life imprisonment for the culprits with mobile phone dealers urged to complete Sim card registration in the country.